Wrinkles and fine lines usually occur on different body parts due to excessive sun exposure and age. It has been believed that such creases, folds and ridges on the skin are also caused by facial expressions and movements. With the growing age, skin begins to lose its elasticity that result in deeper and visible facial issues. 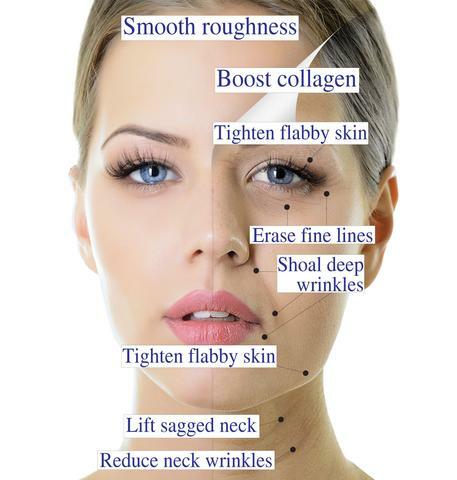 We offer different treatments for Removal Of Fine Lines and Wrinkles in Islamabad, Rawalpindi. Patients come up with improved skin tone right after laser treatment Fine Lines and Wrinkles Removal in Islamabad takes about few months for delivering the final outcomes. Results are not guaranteed as skin continues to grow over age and can give rise to the formation of such type of irregularities again. We can’t get rid of inevitable signs of aging permanently even after getting medical treatments but Skn Clinic is providing number of treatment for fading the appearance of ugly looking skin irregularities according to sufferer’s desires. Therefore, Wrinkles and Fine Lines Removal in Islamabad, Rawalpindi is aiming to remove these issues for giving smooth taut surface of the skin. This treatment doesn’t take more than of 5 minutes. It works by injecting “Botulinum toxin” directly into the muscle. Redness and mild swelling is usually observed right after completing the procedure which settles down quickly. Fillers are used for adding volume to the face. Majorly, hyaluranic acid is applied under the skin for Removal of Fine Lines and Wrinkles in Islamabad, Rawalpindi. It requires zero to no recovery time. The superficial peels uses salicylic, glycolic and trichloroacetic acid that penetrates deep into the skin. These peels play important role in softening the appearance o wrinkles and fine lines. The treatment through dermabrasion exfoliates the affected skin by using an instrument or by sanding tiny crystals. It replaces wrinkles and fines lines with smoother layer of skin. It involves use of lasers to stimulate the production of collagen which aid in plumping up the skin. There are different types of lasers that are used according to the condition of skin. Laser Treatment for Removing Wrinkles/Fine Lines in Islamabad requires no downtime. Once the treatment is done, most of the patients experience splotchy redness on the area of treatment and surrounding that fades within 24 hours. Some patients also experience stinging sensation which is normal. Prior to the treatment, we always provide a free initial consultation at SKN Laser Clinic in which we discuss the various treatment methods of Fine lines and Wrinkles Removal in Islamabad, Rawalpindi and you meet your consultant and the doctor. We discuss the potential treatment method(s), your wishes and expectations. We would be delighted to recommend a protocol that suits your needs. Please fill out the consultation form below. You Don’t Want to Miss This - We have a Special Offer on Fine Lines And Wrinkles For You. You are just a step away!